DataVision is proud to partner with Gervais High School to provide additional Chromebooks to students in the Senior Advisory and Construction Technology Classes through a grant from the Foundation for Rural Service. We thank the Foundation for their continued support in rural communities. 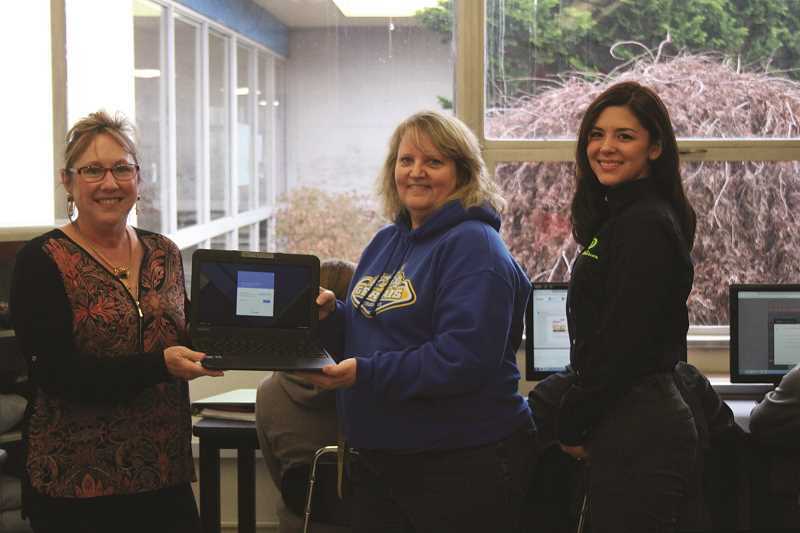 PHIL HAWKINS – From left, DataVision Cooperative President-General Manager Renee Willer, Gervais High School counselor Myra Adams and DataVision marketing and sales supervisor Marissa Gainer display one of the Google Chromebooks Gervais High School will be able to purchase with their $5,000 grant from the Foundation for Rural Service. The Gervais School District was recently awarded a grant for $5,000 to purchase more than 20 Google Chromebooks for classroom use at Gervais High School.The grant came in cooperation with local telecommunications company DataVision Cooperative, which reached out to the Foundation for Rural Service (FRS) — a fellow member of the National Rural Broadband Association — to apply for annual grants that the FRS awards to small towns around the country. The Chromebooks will help provide students mobile access to the internet that they can use to complete homework, apply for scholarships and colleges and seek job opportunities. “This grant would replace currently outdated technology and allow students to develop skills that will allow them to be competitive as they move from high school to college, trade school and into the workforce,” Willer said. The grant is one of nine awarded this year by the FRS, which seeks to partner with local telecommunications companies around the country to help enhance the quality of life in rural towns. The Gervais grant is the largest that FRS handed out this year, totaling nearly $26,000 in grants to rural cities in the United States. Phil Hawkins covers all things sports and Gervais. He can be reached at 503-765-1194 or phawkins@woodburnindependent.com.